Communities on Jeju, South Korea’s ‘island of peace’, are resisting a second airport that’s threatening the island’s farming, nature, culture and way of life, writes Rose Bridger. Linked mega-projects include an ‘Air City’ of shopping malls, hotels and offices, plus high-speed transport corridors, luxury resorts, casinos, theme parks and golf courses – all catering to wealthy outsiders. Government and corporate powers are combining to impose aviation-dependent tourism megaprojects in Jeju. But islanders’ resistance gives hope of a more sustainable tourism, enabling visitors to enjoy the island without contributing to its destruction. In November 2015, a sudden announcement of a new airport on the South Korea island of Jeju, came as a huge shock for residents of five villages – Onpyeong, Sinsan, Susan 1, Nansan and Goseon. They were not involved, or even consulted, in the decision-making process about the airport, and are and worried that they face displacement from their lands, homes and villages and total disruption of their lives. Most of the site, 70%, is a farming area, placing agricultural livelihoods and food production at risk. Little consideration had been given to the impact on rural communities that have thrived in the area for many generations. Villagers immediately became distressed at the prospect of being forced to relocate, worried that they might receive a low level of compensation that would be insufficient to build a new life. Situated 100 kilometres off the southern coast of South Korea, with a dramatic volcanic landscape featuring black sand beaches, waterfalls and lava caves, Jeju is already a major tourist attraction. The Ministry of Land, Infrastructure and Transportation stated that the airport, aUS$3.5 billion project to be built by 2025, would enable a dramatic increase in the number of visitors. Initially with one runway the new airport would be large enough to accommodate 25 million passengers annually. If the airport were to operate at full capacity this would constitute an enormous influx of tourists to an island with a population of just over 604,000. Yet planners envisage that the airport could be expanded to accommodate an even higher number of passengers, with the possible addition of a second runway 20 or 30 years into the future. Governor of Jeju, Won Hee-ryong, said the new airport would be “the largest project in the island’s history.” And it would be the starting point for an even larger megaproject; the province has plans for an ‘Air City’ around the new airport, a complex of shopping malls, convention facilities, hotels and financial centres. An ‘Air City’ is another name for an ‘aerotropolis’, urban development that is built around an airport and designed to be aviation dependent. Pursued by governments and corporations worldwide, many aerotropolis projects are meeting with resistance from communities facing displacement and destruction of farmland and ecosystems, including in Taipei (Taiwan), Bhogapuram (Andhra Pradesh, India), Kulon Progo (Indonesia), Kilimajaro (Tanzania) and Istanbul. A second Jeju airport would jeopardise the pristine natural environment that is key to the island’s distinctiveness as a tourist destination. The tranquillity of Sunrise Peak, a 182 metre high cone rising from the sea with a large, green crater on the island’s eastern edge that is UNESCO protected and a particularly iconic visitor attraction, would be ruined if aircraft fly over it. The area earmarked for the airport has unique ecological and geological features, including 18 subterranean lava tunnels. Honinji Pond, one of the most sacred historical sites, where, according to legend, farming began on the island, is close to the proposed site. In contrast, various mega tourism projects would be supported by construction of a second airport, most notably Jungmun Tourist Complex and Jeju Myths and History Theme Park. Jungmun Tourist Complex, transformed a small fishing village into one of South Korea’s biggest resorts with upmarket hotels, coachloads of daytrippers, watersports, yachts, shopping, and an 18-hole golf course. Upon completion Jeju Myths and History Theme Park will be one of South Korea’s largest integrated resorts. Originally conceived as a celebration of Jeju heritage, it was approved in spite of considerable local opposition because the project plans morphed into theme parks based on other ancient cultures such as Persia and the Inca Empire. There was also disquiet over plans for an underground casino, pursued with a lack of transparency, and concern that little of the profits will reach the community. From a provincial government announcement it appeared that a second Jeju airport had already been granted the go-ahead. Banners proclaiming ‘Second Airport Plans Confirmed‘ were displaced in Jeju City. But representatives of communities opposing the airport insisted that the project was not finalised; it had yet to receive the required validation from the Ministry of Strategy and Finance and the National Assembly. By late December banners opposing the airport extended 20 kilometres along roads leading to the five affected villages. Hundreds of people, young, old and students, participated in a series of demonstrations against the airport. Protests drew on shamanic traditions, channelling a multitude of spiritual energies including the three founding fathers of the island and Yougdeung, Goddess of the wind and sea. Resistance was pitted against a considerable weight of pro-airport propaganda. Prominent advertisements extended beyond the affected villages and were highly visible in Jeju City. The media presented reaction to the airport plan as a split of opinion, but the vast majority of locals, who stand to suffer the worst of the negative impacts, were opposed to it. Unity in resistance against the new airport was still evident in the affected villages in January. Red and yellow protest flags emblazoned with slogans such as “Gieonara!” (Get out!) and “Second Airport Out! Oppose! Stop!” adorned buildings and cars. Protesters challenged the flouting of democratic process. They blocked the entrance to a briefing meeting, demanding a full public debate and that the full study upon which the site for the airport was selected be made public. Campaign leaders spoke of their concern that the destruction caused by the airport would be compounded by urban sprawl from the ‘Air City’ and vowed to continue their fight for the future of their communities. Jeju islanders have form in sustaining long-term resistance against destructive megaprojects. Construction of an enormous naval base, with space for 24 warships, at the tiny village of Gangjeong on the southern coast of the island. It incorporates infrastructure for mass tourism: a port with space for the largest luxury cruise ships. Due to open in 2017 it is expected to handle 1 million cruise passengers by 2018. The naval base has met with a nine-year non-violent struggle. Construction went ahead even though the result of a referendum was a resounding ‘no’; 94% of the village population of 1,900 people voted against it. Rejection of the naval base plan was inevitable. Jeju is widely known as the ‘island of peace’, a culture with deep roots originating in response to the 1948 massacre of between 30,000 and 80,000 people, men, women and children. They were killed by Jeju authorities, at that time under the command of occupying US forces. Brutal repression was triggered by an uprising of locals opposing north-south division of Korea. Bodies were buried in mass graves across the island. 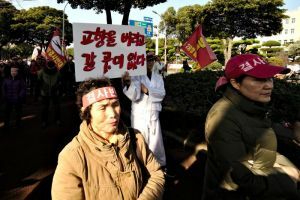 The movement against the naval base opposes militarisation of the island and South Korea, and planned use of the facility by the US military to support its strategic interests in the region. 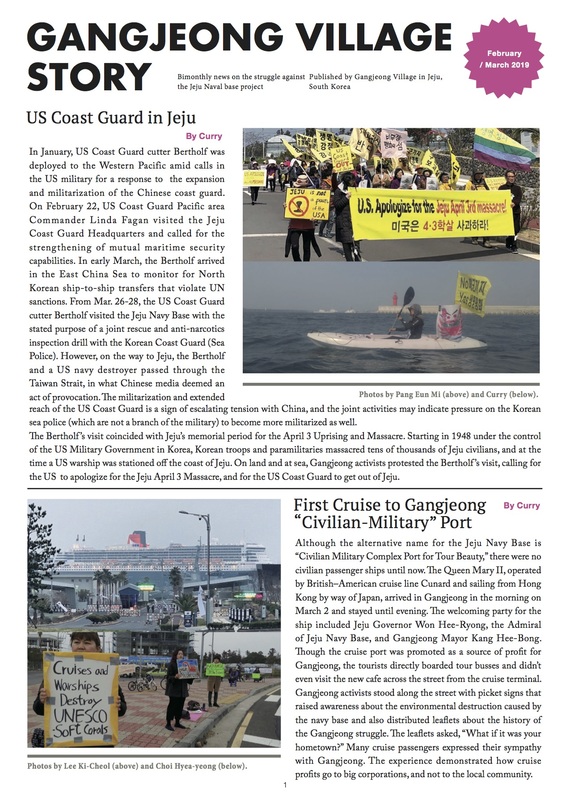 Jeju Naval Base forms part of an arc of US naval and military bases encircling China, aiming to counter the emerging superpower’s military build-up. Unique marine ecosystems are being destroyed. The sea of Gangjeong is a key habitat for the few remaining Bottlenose dolphins living around Jeju island and the world’s largest soft coral forest began dying after construction commenced in 2011. Marine food sources and fishing livelihoods are being destroyed. As explosives were laid at the site, to blow up rocks and the sea bed in preparation for construction, a large area of traditional diving grounds, where women have harvested abalone (marine snails) and other shellfish for many generations, was roped off. Every day, except Sundays, protesters gather at the site entrance, physically blocking bulldozers and delivery of construction equipment such as cement mixers. They have successfully stalled the project many times. Villagers and activists responded to blocking land access to the construction site by taking to the seas, swimming and kayaking, to block cassions and dredging barges and monitor the environmental damage that is being inflicted. Peaceful protest has been criminalised. About 600 people have been arrested, 400 of them charged with offences, but resistance continues in spite of imposition of fines and imprisonment of two activists. Some anticipate that, if construction of a second Jeju airport goes ahead, an even greater protest movement will rise up against it. Jeju islanders have succeeded in halting construction of a luxury resort and residential complex. The site is in Yerae, Seogwipo City, on the southwest coast of the island. On 30 March 2015, the Supreme Court upheld a suit filed by a group of landowners, overturning land expropriation and requesting cancellation of construction. A groundbreaking ceremony for the complex had been held on 7th March 2013 and the resort, the largest single foreign investment in the South Korean tourism industry, began to take shape, a major destination targeting northeast Asia. Plans showed that it would be geared towards visitors traveling by air, accessible for over 10 million people via a two hour flight. The resort complex, called Jeju Airest City, is a joint venture between the Berjaya Group, a Malaysian hotel and resort conglomerate, and a public-private entity, the Jeju Free International City Development Center (JDC). A promotional video shows the vision for the project, eulogising Jeju’s pristine environment, then proceeding to illustrate how large areas would be ruined with enormous buildings that supposedly evoke iconic natural features. The focal point, the ‘Casino Town’ complex, features a gigantic tower, the upper reaches vaguely resembling the contours of Sunrise Peak. Obliteration of natural landscape would be further compounded by construction of the largest shopping mall in Jeju, hotels and condominiums, entertainment venues, corporate premises, a medical centre and a cosmetic surgery centre. In an interview for an architecture website the Project Director of Berjaya Jeju Resort Limited makes it clear the site for was not just selected for desirability and strategic location, emphasizing support from the government, both national and local, as an important factor, along with various incentives for foreign investors. Property developers and investors worldwide were so enamoured of Jeju Airest City, that, in 2012, it won a ‘Gold Award for Best Future Mega Project’ at the MIPIM Asia Awards and a 5 Star Award for Best Mixed-use Development at the International Property Awards. The landowners’ suit against Jeju Airest City succeeded in upholding a law stipulating that recreation zone development must contribute to the welfare of residents. The Supreme Court ruled that the project aimed to generate profit for specific parties and that the developer had misled landowners over the use of the site. Inclusion of luxury condominiums and a casino meant that the project failed to satisfy requirements for serving the public good, and should have been categorised as an ‘amusement park’ rather than a ‘residential type complex’. By not being explicit about its intentions for land usage Berjaya had avoided paying landowners their rightful premium. Initially, Berjaya ignored the Supreme Court ruling, continuing construction until finally abandoning the project in July 2015. Jeju Airest City had been about 60% completed. Now it lies dormant, but the Jeju province moved to resurrect the project, attempting to push it through the legislature by amending the law to bring management of amusement parks under its auspices. One of the landowners who refused the increased compensation offer, Kang Min-cheol, chair of Yerae Ecological Village, warned that the resort complex was indicative of a wider picture of inexorable pressure for intensive urban development modelled on Hong Kong and Singapore, urging people to seize the last chance to save Jeju from “reckless development”. In February, following the second airport announcement, and in the face of continued resistance against it, another tourism-oriented megaproject plan was announced. A consortium supported by the provincial government called for a high-speed transportation network of rail and bus routes linking Jeju Island’s main commercial and tourism centres. The scheme raises severe environmental concerns, including the impacts of construction activity and road building. Scope for consulting affected communities will be limited if, as envisaged, design plans are finalised within a matter of weeks. The proposed route consists of four key nodes. Jeju City would be linked with upcoming tourist hotspots: Seogwipo, Jeju Myths and History Theme Park and the second airport. Amap of the proposed high-speed route indicates plans for an aerotropolis around the second airport site, where the only words written in English appear: ‘Air City’. The high-speed transportation network would support development and growth of the second airport and an aerotropolis surrounding it. Aviation growth could also be served by a broader programme to make Jeju a luxury tourism hotspot. Announced by Governor Won Hee-ryong at the beginning of March, the focal point is a so-called ‘celebrity town’, provisionally named ‘Star Village’, in Seogwipo. Won Hee-ryong indicated special backing for the aviation sector, pointing out the high fuel use of aircraft and stating that financial support from central government would be required. He also called on President Park Geun-hye to take steps that would serve to expedite development of a second Jeju airport: minimising the assessment review period and allocating $4.1 million for a development plan. Government and corporate powers are combining to impose aviation-dependent tourism megaprojects in Jeju, posing grave threats to the environment and cultural heritage. But islanders’ track record of resistance gives hope that a path for more sustainable tourism can be forged, enabling visitors to enjoy the island without unwittingly contributing to destruction of its treasures. Rose Bridger (@RoseKBridger) is a founder member of the Global Anti-Aerotropolis Movement (GAAM) and the author of Plane Truth: Aviation’s Real Impact on People and the Environment, published by Pluto Press. ‘Pave Paradise, put up a naval base‘ by Medea Benjamin, 22nd June 2015. ‘Jeju, Korea’s ‘Island of Peace’ in the crosshairs of war‘ by Mica Cloughley, 19th December 2014.